Eucalyptus Species are also known as Gum Trees or Eucalypts. Eucalyptus species are the most important tree species in Australia. With many species Eucalypts are suitable for a variety of landscaping uses, as street trees and in the home garden. Eucalyptus trees and species have evolved to be an extremely drought tolerant species. If planted as seedlings the main problems are weeds and browsing animals. Protection at the early stages of growth will ensure a greater survival rate. Eucalypts have a valuable place in landscaping, Eucalyptus papuana, Corymbia aparrerinja and the other species we call ‘Ghost Gums’ are used for the striking white trunks. Flowering eucalypts such as Eucalyptus leucoxylon or Yellow Gum are long flowering and reasonably fast growing. Eucalyptus kitsoniana is a smaller growing Eucalypt suitable for street planting or even container growing. 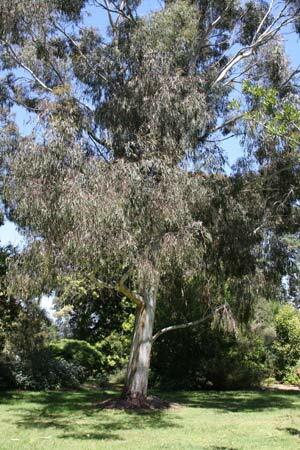 Eucalyptus maculata is another popular landscape tree. Eucalyptus melliodora, Eucalyptus microcarpa, Eucalyptus ovata, Eucalyptus pauciflora, Eucalyptus pauciflora ssp little snowman, Eucalyptus polyanthemos, Eucalyptus pryoriana, Eucalyptus radiata, Eucalyptus scoparia, Eucalyptus sideroxylon, Eucalyptus sideroxylon ssp, Eucalyptus tereticornis, Eucalyptus viminalis, Eucalyptus camaldulensis, Eucalyptus citriodora, Eucalyptus elata, Eucalyptus ficifolia, Eucalyptus Maculata, Eucalyptus leucoxylon ssp megalocarpa, Eucalyptus leucoxylon ssp connata, Eucalyptus leucoxylon ssp, Eucalyptus leucoxylon ssp, Eucalyptus maculata, Eucalyptus mannifera, Eucalyptus mannifera ssp little spotty. Richard Tomkin is the producer of spectacular grafted hybrid grevilleas (Large Super Tube - Square) Over 400 species, grevillea cultivars and hybrids. SPECIALTY TREES 1060 Wellington rd Narre Warren East Vic 3804 Ph 03 9796 8308 Fax 03 9756 8222 Suppliers of advanced evergreens to the landscaping industry. Growers of natives, exotics and a selct range of deciduous trees to 4m. Contract growing to client specifications.